← Peach Day at Western Wake Farmers’ Market – Saturday July 12th! Acorn Kitchen Pop-Up Picnic This Sunday July 13th! I love Pop-Up events. This Sunday Acorn Kitchen is holding a Pop-Up picnic at a secret location. So grab a blanket and your favorite bottle of wine and join them for a (pre) Bastille Day picnic. 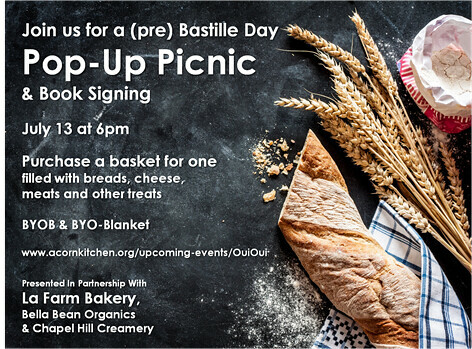 Acorn Kitchen has teamed up with La Farm Bakery, Bella Bean Organics and Chapel Hill Creamery to pack a picnic basket that even the French would envy. Lionel Vatinet, author of A Passion For Bread, will also join us for a special book signing. Basically, it’ll be the real-life Raleigh version of La Vie en Rose. Visit www.acornkitchen.org/upcoming-events/ouioui to reserve your seat. I’m in. How can reserve my spot? RSVP and purchase your basket (serves one person, $35) no later than July 10th. This game had a promising. I enjoyed it for quite a while.